Effective Sales Managers, are those that can Teach & Motivate Sales People to Learn and Adapt to New & Improved Sales Processes, Resulting in Continuous Profitable Sales & Customer Growth Performance. 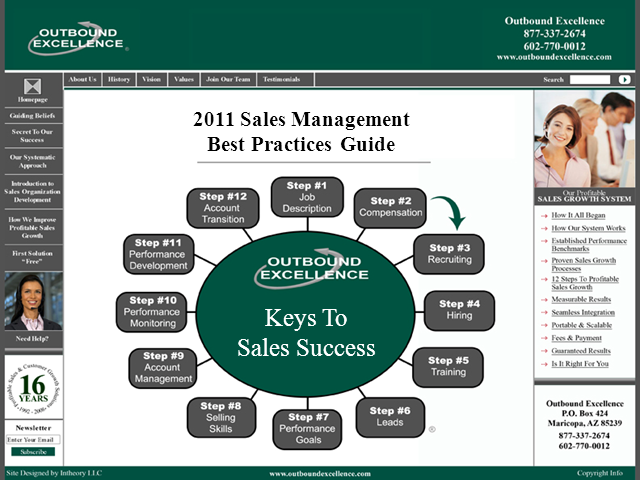 After 12 years of providing B2B Organizations with Sales Management Training and Development On-Site Services, Outbound Excellence is now offering Sales Management Training and Development Services as a Cloud Based Offering. If you are looking for a Turn-Key, Sales Management System that will lead your Sales Organization to Achieve and Maintain Continuous, Profitable Sales & Customer Growth Performance, then our Outbound Excellence “Cloud Based” Sales Management Training & Coaching System is the perfect solution.